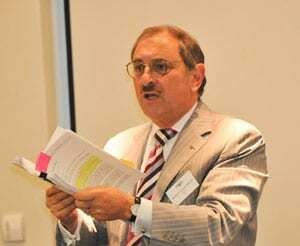 Dr Danny Lamm is the new president of the The Executive Council of Australian Jewry. 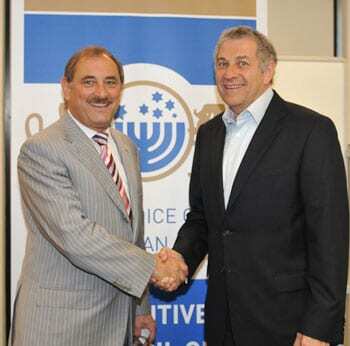 The Executive Council of Australian Jewry is an umbrella organistation whose constituent members include the presidents of the Jewish communites in all Australian states plus other significant groups. In his final address to the ECAJ, outgoing president Robert Goot focused on an issue hot in the news at the moment….the fraud perpetrated in New York by 17 individuals on the Holocaust Claims Conference. Goot told the meeting that the money had in fact been paid by the German Government and not by the Claims conference itself…and that six employees of the Claims Conference were among those arrested. Goot said that the ECAJ endorsed the call for a full independent forensic audit of the Claims Conference which was founded in 1951. Two fund funds had been defrauded. The Article 2 fund which provides a monthly pension and the Hardship fund which makes a one off payment to successful applicants. Goot said: “The funds were paid by the German government to certain classes of survivors administered by the Claims Conference and the funds are two of many. Founded by Nachum Goldman the current president is Julius Berman who chairs the allocation committee, but has no vote and works pro bono. Goot added: “There are two executive vice-presidents, Gideon Taylor and Greg Schneider. Of the 64 people on the boards senior leadership there are representatives of key survivor and national organisations..
Goot made an analogy about the funds paid by the Claims Conference on behalf of the German Governments stating “an unemployment claim made fraudulently in Australia does not affect the entitlement of a genuine receiver. Such suggestions are irresponsible have caused great angst among the survivors. Some staff in the New York office were responsible for processing claims using false details. All arrested were Brooklyn Russians” . He went into detail mentioning that the fraud had included change of towns of residence and birth dates. The Claims Conference is claiming compensation and restitution some of which has been paid. Goot told the meeting that the Article 2 fund, defrauded of $24.5m, had been affected by 658 application out of a total of 176,000 and the Hardship Fund had 4957 recorded fraudulent claims out of 457,000. The Claims Conference, on whose board Goot sits, is the successor organisation for funds generated by claims for which there are no heirs. Goot said that the part of the funds are being used for research education and documentation, using some of the funds it has available. It used to contribute 20% then reduced it to 10% and it is now 5% represented by around about $10m… Goot said that the Claims Conference’s web site details the projects with funds going to organisations throughout the world who look after survivors. He said that $1.2 million dollars are divided equally in Melbourne and Sydney and are given to the cities’ welfare societies. Goot then broached the subject of what he called ‘the billion dollar myth’. He responded to those who ask why the Claims Conference is sitting on this cash and why it is not paid it to survivors Goot said: “Yes…there are assets of $1.03 billion. But there also liabilities. He said that $211 million was paid to heirs of property appropriated by the Nazis and that $360 million had already been allocated for home care health and medicine. 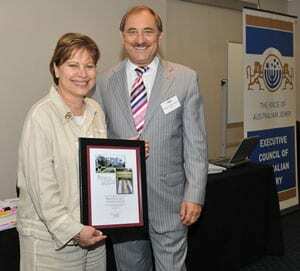 In Australia, JewishCare is a recipient. $543m has been retained for 2011 so that similar payments can be made. Goot made mention that under the stewardship of Ronald Lauder, the Claims Conference did not lose one cent during the Global Financial Crisis. 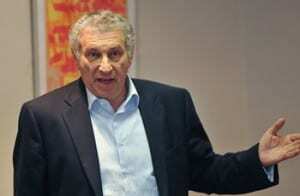 He said: “Ronald Lauder had kept the money in bonds and nothing in speculative funds. Goot believes that within four years, the money will have dried up and that it is essential to start seeking more endowments. He said that the ECAJ through its directors on the board of the Claims Conference should report to the ECAJ on a regular basis. We put the Claims Conference on watch…. Former ECAJ president Nina Bassat sits on the Board of the Claims Conference with Goot and is a survivor herself. She told the meeting that it was essential to spend some of the money to ensure that that the Shoah would be adequately documented and remembered and taught. Justice Stephen Rothman reminded the meeting that Australia itself had very sophisticated controls in place to combat tax and social securiyt fraud…but it cannot stop the frauds occurring. Dr Suzanne Rutland addressed the meeting on the subject of Boycotts, Divestment and Sanctions. “I am at the coalface at Sydney University. I am surprised as to how many members of the Sydney Jewish community do not know what BDS stands for. It is my daily bread. Within the campus the fight has to fought by sympathetic academics, both Jewish and non-Jewish. She quoted the university’s Professor Jake Lynch as saying: “Israel is a criminal State” quoting the Goldstone Report to support his point of view. She said that Lynch had said that there should be a boycott on the Hebrew University and the Technion because “they are preparing the doctors and lawyers for the criminal State”. She said people like Antony Loewenstein advocate the dismantling of the Zionist entity. The Conference finished with an address by the new President, Dr Danny Lamm, who without going into great detail, told the meeting that it was his intention to visit every State and to develop a strong working relationship with the respective administration. The COnference was addressed by Senator Don Farrell and the Australian National University’s Professor Hugh White with Israel Ambassador Yuval Rotem being the keynote speaker at the dinner.